A regional publisher’s national daily for the North of England will close tomorrow less than six weeks after its launch. The CN Group has announced Friday’s edition of 24 will be its last after failing to find the “scale” of audience it had hoped for. Sales of the newspaper had dipped following what the company described as a “steady” start following its first issue on 21 June. The group had hoped to promote the newspaper as an alternative to “London-centric” news coverage, with it being dubbed ‘The North’s National’. The tabloid, priced at 40p, has been circulated in an area of the North West stretching from Preston in the south to Lockerbie in the north and Workington in the west to Hexham in the east. The closure was revealed in an announcement to staff by CN Group chief executive Miller Hogg, which has been seen by HTFP. No jobs have been lost as a result and the two new staff recruited to help with the newspaper, which took much of its content from the Press Association, are being moved to other roles within the group. In the announcement, Miller said: “We were specifically trying to see if there was a disenfranchised national readership from those who wanted their national news without any spin or rhetoric. This audience in the scale we need is obviously not there. “The sales have dipped following a steady start in the first few weeks and the senior team and myself have come to the conclusion that it does not have a future despite our best efforts. “As I said when we were launching it, we will be brave and decisive in our plans for launching things but at the same time have firm success measurements and not keep something going if it’s not attaining, or close to attaining, those criteria. Miller added a lot had been learned during the launch period which would help the company “tremendously” in future planning for other ideas. He also praised group editorial director David Helliwell and 24 editor Mike Haworth for their work on the project. Miller continued: “We have not taken this decision lightly and we have looked at many ways to see if 24 still has a future. “Despite our best efforts in looking at how we could continue it into our two dailies or keep it as a digital product we could not make the numbers work, therefore it will cease as a brand with its last issue printed and published on Friday 29 July. “There are no jobs impacted as a result of this decision as those working on 24 will be asked to work on other projects or move to one of our vacant positions within the group. This project has not cost the business as all investment has been self-financed through ads and cover price as well as internal resources. In an official announcement this morning, David added: “We were proud of the design and content and had encouraging feedback and buy-in from advertisers but unfortunately copy sales are just not high enough to justify continuing daily publication. It was always a calculated risk to see whether there was enough of a gap for us to squeeze into beside the big beasts of the daily market and it hasn’t come off. “We launched quickly, failed quickly and learned an awful lot along the way. We’re obviously disappointed it didn’t work out but it hasn’t diminished our appetite for trying new publications, be they print or digital. Another brilliant launch in the year that gave us New Day. Who on earth thinks of these turkeys and, even more importantly, who gives the go-ahead? Still, like TM before it, CN has “learnt valuable lessons” and “not wasted any money” on this dismal project. That’s all right then. Six weeks is too short for almost any project to come to life, there is failing hard and quick, but if there is not a proper crack at things it does point to an entirely pointless exercise. 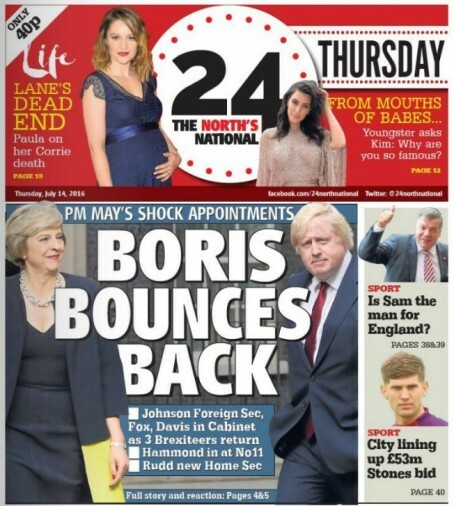 So while the North’s national is taken out the back and put quietly out of its misery, the New European gets an extended run. Looking at the two publications, is this a case of CN not really understanding its market before rushing headlong into publication? Sad, but totally inevitable news. The rather forced upbeat remarks by the chief executive and the editor don’t cover up the fact that this was never going to work. They get rid of 20 experienced journalists beforehand, then bring in people to work on this ill-fated publication, yet those people will keep their jobs. How does that work? Totally agree with RTRTRT – the towel seems to be thrown in almost immediately. Hard to see any new newspaper working given the current climate and the way recently launched titles have failed. So that’s answered one question. The answer is no, people wouldn’t pay for the Metro. If this isn’t another warning bell sounding the demise of news print titles I don’t know what is. Why groups and individuals continue to invest time money and thinly stretched resources on launching papers yet can’t accept the world had moved on from buying newspapers to read news when they can get it instantly on line and with video, sound bites and live updates is beyond me. The north is, and always has been, a cracking patch for quirky human interest stories – and with a bit of wit and investment in reporters a “northern newspaper” might have been able to exploit, and even champion, the obvious disillusionment with all things south of Watford as shown in the Brexit vote. As far as I could see the problem with 24, apart from the meaningless name, was that with no staff on the ground and 90 per cent of the copy supplied by PA there was barely any northern slant to the content. Even the features were generic word-factory fodder. It was, to all intents and purposes, a national produced in the north (the splash highlighted above was typical). And who’s interested in that? It’s a shame about this. Print is getting a bad name and that’s not the issue. It just wasn’t available anywhere! Nothing ventured, nothing gained…What else can I say? The whole thing smacks of amateurism and ego. Somewhat Machiavellian theory from Salford Lad but he may be on to something. Carlisle and Barrow dailies barely sell 20,000 copies between them. So replacing them with a single title modelled on 24, which was clearly popular with advertisers, who matter more than readers nowadays, makes commercial sense. Throw in change pages and reduced production costs and hey presto, those pesky CN pointyheads could be on to a winner that will see them drink every bar dry from Millom to Wigton. Let’s await the next instalment! Another example of a vanity project crashing and burning leaving wreckage in its wake. The splash on that paper in the article is certainly not something you would have seen in a ‘southern focused paper’. What a pointless waste of time this was.